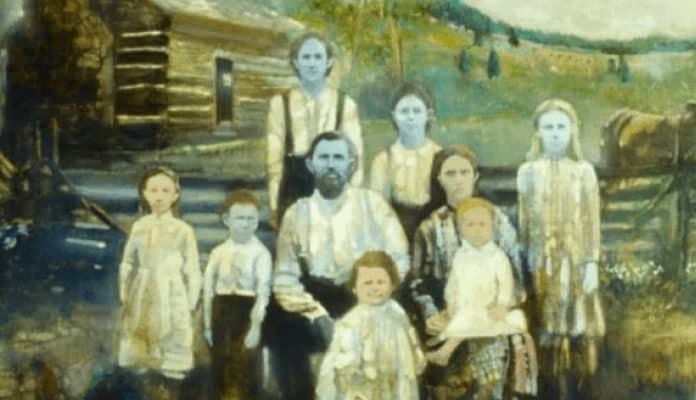 Deep in the woods of Kentucky, a fiercely private family gave birth to blue-skinned children since the 1800s. The color of their skin was so shocking for normal people to see, that they chose to stay hidden away from the rest of society in their small community. Very few people knew they even existed, until today. This sounds like something out of a fairytale, or like the plot of the Smurfs cartoon. But for the members of the Fugate clan, it was all too real. Scientists say that multiple generations of inbreeding resulted in a genetic condition that caused them to be born with blue skin. It is so incredibly rare, nobody has ever seen an example of it since. In 1820, a very unique man named Martin Fugate immigrated to the United States from France. He wanted to settle down for a new life in Troublesome Creek, Kentucky, because the United States offered free land to people willing to settle down there. He was born with blue skin, and his family had abandoned him in an orphanage when he was a baby. They could not handle raising such a different child, and even as an adult, he opted to help settle the wilds of Kentucky, where no one could see his face. Once he was in Kentucky, he met and married a red haired woman named Elizabeth Smith. Even though they were from different countries, and the odds were probably a billion-to-one, they both carried the recessive gene for an extremely rare condition known as Methemoglobinemia. Martin and Elizabeth Fugate would go on to have seven children together, and four of them were born with blue skin. Even those who looked normal were carriers of the recessive gene that caused the disorder. Despite having this incredibly different skin color, they were physically just as healthy as anyone else, if not better. They lived to be in their 80s and 90s, without ever suffering from heart or liver disease. At that time, the group of people who took advantage of the land grants and founded the village of Troublesome Creek was incredibly small. There were only four other families besides the Fugates: Combes, Stacy, Ritchie, and Smith. Most of the founders were already married, and there were not enough single people going around for every one of their children to have a partner. So one of Martin and Elizabeth’s sons, Zachariah, married Elizabeth’s sister (Yes, you read that correctly. He married his own aunt.) This close relation triggered one of the bloodlines with the highest percentages of Methemoglobinemia that was so strong, the blue skin lasted in their family for over 150 years. Normally, Methemoglobinemia is so rare, that this condition would no longer show up in the children of the next generation. But the town of Troublesome Creek was so small, they did not even have official roads. People lived in log cabins that were closely clustered together, and there would not be a railroad anywhere nearby to bring in new settlers until 1912. Since there was not a huge variety in the gene pool, there was a lot of inbreeding going on, with people marrying their first and second cousins. The predisposition to be born with the genetic disorder kept passing on to each new generation. These people who were born with blue skin were embarrassed, and even though their families accepted them, they knew that the rest of the world would not. For this reason, they did not want their picture taken, and they did not want to become the subject of medical experiments. So they continued to live deep in the woods, for fear of being called a monster. Some of the pink-skinned family members moved away in the 1900’s, but for those who stayed within their comfort zone of Troublesome Creek, it only forced them to continue picking someone to marry from one of the four families. This meant the blue skin kept coming back every generation.